Self-esteem gets thrown around a lot as if it’s an elusive “thing” that you either do or do not have much of. “Oh, you have low self-esteem” is used a lot as an explanation. 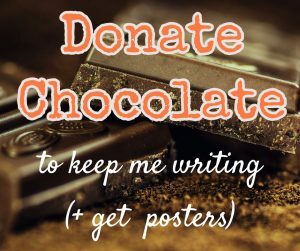 When you have low-self esteem you put up with all kinds of abuse, right? But what exactly is self-esteem and why do some people have “plenty” while others have little? Ultimately, self-esteem has a lot to do with how you make decisions. Do you make decisions from the inside out, or from the outside in? When you make decisions from the outside in, you end up with low self-esteem. You look to other people first before you decide what is and isn’t o.k. To an extent, that is healthy social behaviour: what is happening in this group? What are the unspoken rules? Yet, when you have a habit of low self-esteem, you take this attitude to the extreme. It’s not your fault, it’s just something you learned to do from a very young age. Instead of assuming that you deserve to be treated well regardless of how other people feel and regardless of what other people need or do, you take whatever you get and assume that is what you deserve. With low self-esteem there is an internal process that reasons backwards from the treatment people give you. So you start with what comes after the “=” sign and figure out your worth from there. Someone with low self-esteem however wouldn’t even think about what they are worth independently of how they are judged. Do you see how this can really skew your perception? I’m not saying the “I am an 8” approach is foolproof either. There are people who are quite convinced that they are great, while they do a shoddy job repeatedly, treat others badly, and are just quite an awful person to be around (and some serious self-improvement wouldn’t be a bad idea!). So, looking at how other people evaluate you is not wrong. Having an accurate sense of your own value is not easy. It’s hard to evaluate yourself. It’s hard to know what to base your self-esteem on at times. The point is not to boost your ego, the point is to be honest and accurate. If you’re surrounded by friends who are afraid to tell you the truth, because they don’t want to hurt your feelings, your sense of self can be unjustly inflated. Yet, equally, if you are surrounded by frenemies who constantly look for ways to criticize you for the smallest thing, then you can end up with low self-esteem when you assume that they must be right. Our families of origin have a lot to do with our self-esteem blinders. If you come from a healthy, well-adjusted family, chances are that you’ll have a pretty accurate sense of yourself. You can be confident about your achiev­ements­, while still feeling deep down that you really don’t deserve to be treated well. There is a difference between “yes I can do this” and “yes I am worthy”. In fact, when you have low self-esteem, you might be using achievements to make yourself feel better. When you can’t be successful at doing something however, your deeper sense of self-esteem will bleed through. Hence, you might keep yourself compulsively busy. 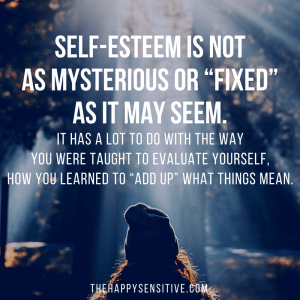 Self-esteem is not as mysterious or “fixed” as it may seem. 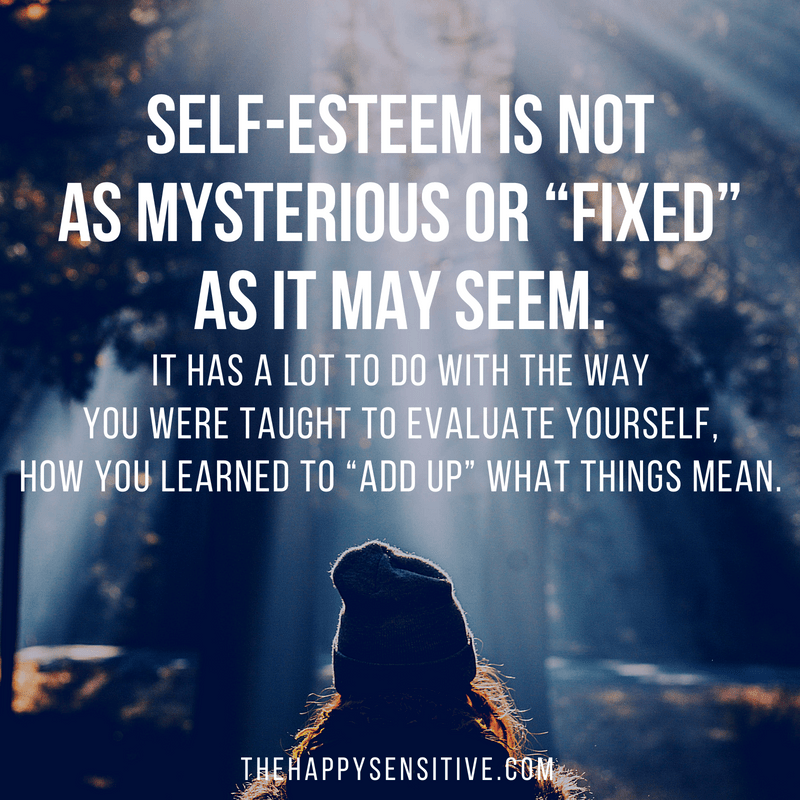 It has a lot to do with the way you were taught to evaluate yourself, how you learned to “add up” what things mean. By learning how to re-evaluate your inner self-esteem formula, your self-esteem can improve naturally. It all boils down to understanding how your brain is doing the self-esteem math, and mindfully stepping in to question if that mathematical logic is sound or not. P.S. The HSP Comfort Kit is a good place to start. For a customized deep-dive to unravel self-esteem issues and create positive, protective boundaries that keep your energy high, take a look at the Happy Sensitive Foundations Programme. Next post: Reader Question: Am I the Crazy One?